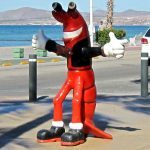 On the Malecon in La Paz, at the northern end of the town is a small but wonderful Mexican Restaurant named Mariscos Los Laureles. No reservations are needed, the attentive staff will quickly come to your table as soon as you select a place for your party to sit. I recommend the patio in front, for the best view of the sea and to watch the people passing by. Simply put, I fell in love with this place upon my first visit. 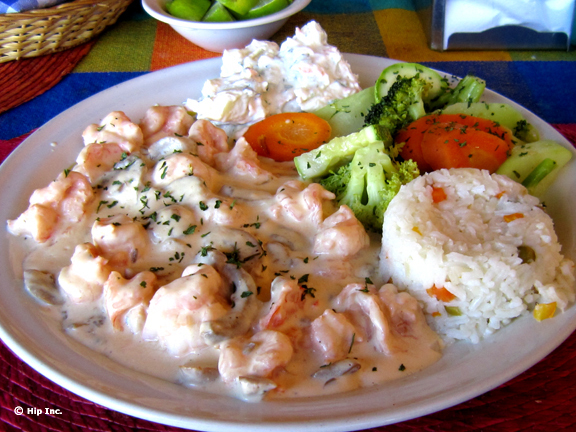 That evening I had camarones (shrimp) in a cream sauce with sides of green salad, potato salad and coleslaw. Served with fresh tortillas (your choice of flour or corn), tortilla chips and salsa, this meal was delicious and very filling. 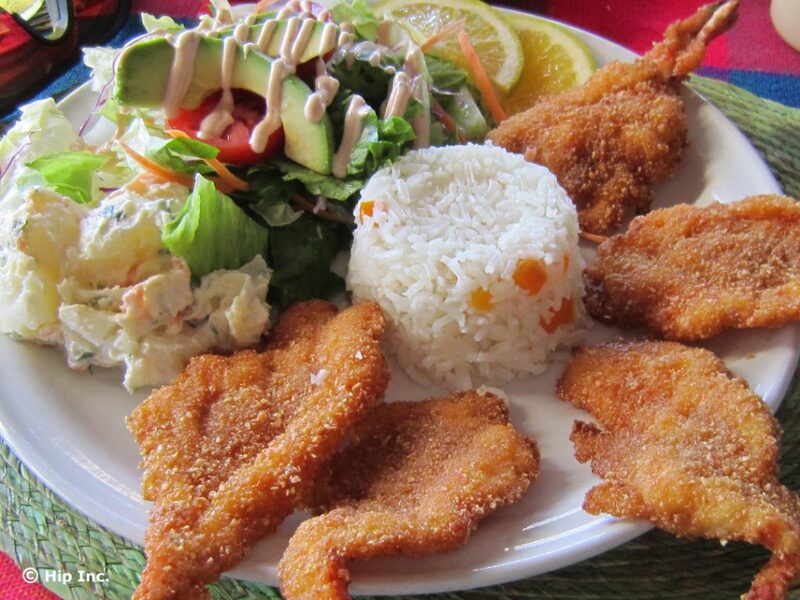 The portions are large here at Los Laureles. There is also a ceviche bar, where you can sit and have a snack of ceviche on toast, in a goblet, or by the liter to takeaway! The beer is always flowing, the atmosphere quite congenial and everyone is happy to enjoy their meals here. 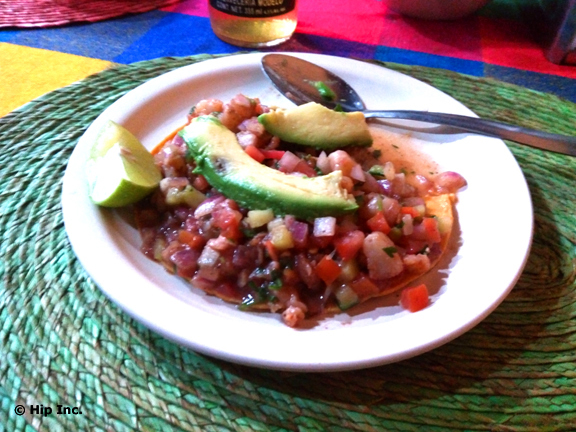 Returning for a second visit the next day, I sampled the ceviche on toast, which was very fresh, and delicious in a bath of lime juice and spices. That time I had a main dish of fried shrimp which were also quite good. 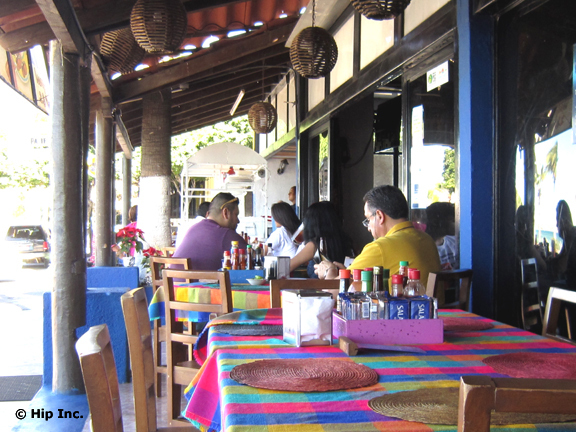 Sidewalk seating at Mariscos Las Laureles. Some people say this place is more tasty than the sea and I must agree! Not only are the prices reasonable, the service is excellent, and the food portions are quite filling. If you arrive and it’s too busy for you to get a sidewalk table outside, take a stroll on the Malecon while waiting, you won’t be disappointed. The address is Paseo Alvaro Obregon, Esterito, 23020 La Paz, B.C.S. The telephone number is 612 128 8532. Copyright © 2019. All Rights Reserved Hip Inc.